ItemBARK_1990.0003.0080 - Unidentified Chinese woman and boy; circa 1910. Item BARK_1990.0003.0080 - Unidentified Chinese woman and boy; circa 1910. Unidentified Chinese woman and boy; circa 1910. 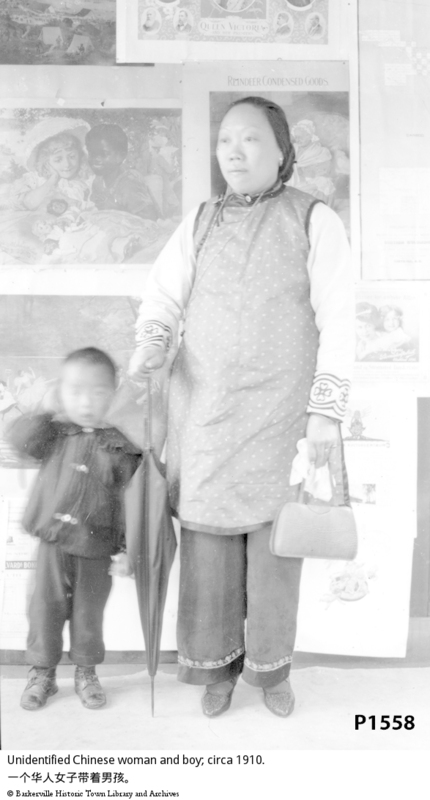 A Chinese woman standing in front of a number of posters with a Chinese boy to the left. She is holding an umbrella in her right hand and a purse in her left hand. Behind them are poster, one of which is for Reindeer Condensed Goods and another of Queen Victoria. The same woman is in P1976.